There are multiple methods to disable Nvidia telemetry at startup. I’ve listed two of these methods, screenshots included. The first method is by using the Windows Task Scheduler. The second (optional) method, is by using Sysinternals Autoruns. See screenshots for further details and instructions. 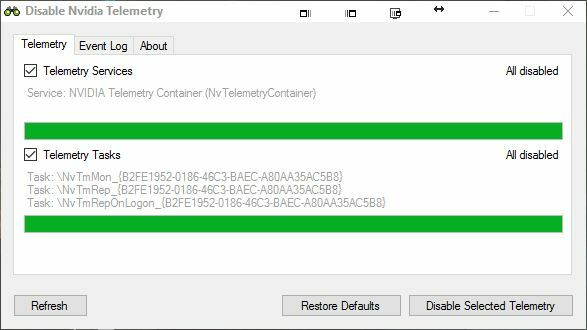 In addition to disabling Telemetry startup, the “NVIDIA Telemetry Container” service will need to be disabled as well. Ensure that the service is stopped and that the “Startup type” is set to “Disabled”. An all-in-one solution for disabling Nvidia Telemetry exists by using a program that is aptly called Disable Nvidia Telemetry. The program will automatically apply all the changes in the previous screenshots. Remember, that these steps may need to be applied again in the future if the Nvidia drivers are updated.